First, I would like to introduce myself and tell you a little about myself. My name is Oleg, I am from Ukraine and over 5 years I’m developing web-interfaces. At first, it was a little hobby that finally turned into my main job. The work is consists of making not just a beautiful website interface or mobile interfaces, and also make a product that will be sold. But we won’t consider in detail my work and we will pass further. In contrast to the other delegates and users, I don’t write code. My main job is to create interfaces and graphics, but here is the most interesting. As you know, the systems ARK have very few games that would have attracted public attention and now I will tell you how to fix it with the help of our project. “BALLWARS” is a free online game where each player must do only one thing… to survive. Interesting and exciting game in the third person (top view), with the elements of agario and tanks (90). All players are expected by more than 30 different cards, up to 10 types of weapons and, of course, up to 15 animated characters. Playing in normal battles, every player who fulfilled certain conditions can participate in cash tournaments (this functionality will be implemented in version 2.0.0 of the game)! This game can be played from any PC or phone (android, IOS), because the game is a free browser game with great potential in development. At this point, already made full Dizdok in the first version of the game “BALLWARS 1.0.0” and made the first sketches of the interface, maps, and playable characters. Start of Beta version of a game is planned for 2017 and at this time we will be giving out invites for testing of a game, before it release. First of all, I’ll try to get a dedicated server worked correctly and was stable formation of blocks. Moreover, by implementing the above given game, we will be able to expand the audience ARK’s, thus attract new investors and developers, making ARK most popular cryptoprotocol. Those are some great characters - love it! 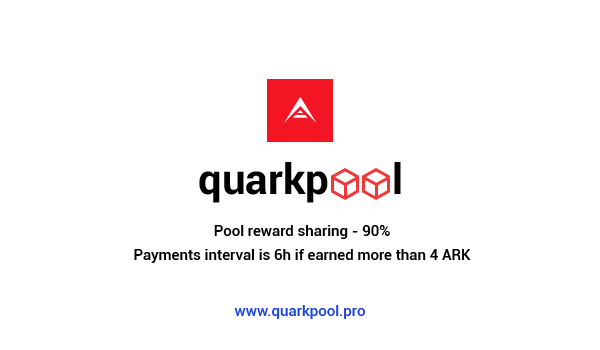 I’m thinking of preparing a whole set when my pool https://quarkpool.pro/ hits the top. A little gift for the community from me. If I vote for you, but don’t quite have enough for minimum payout every 6 hours, will I get the payment every 12 hours? Would PM you on Slack, might be a good idea to put Slack username in signature! If I have 1000 ark, how many I got per week. I send ARK mistake please return it to me . I will vote you after . @Homlrs Problem solved. The money was returned to your account.